One thing Kifaru does very well is listen to their customers and design new pack additions from user feedback. The new 2018 Crater and Cavern packs are a perfect example of this, integrating popular features from multiple Kifaru bags into one. One of my largest draws to the Crater bag was that the size was similar to the Australian Mountain Ruck (AMR) but with more features. Being able to access the giant bag through a side zipper and the independent compression straps on the back were a big draw for me. 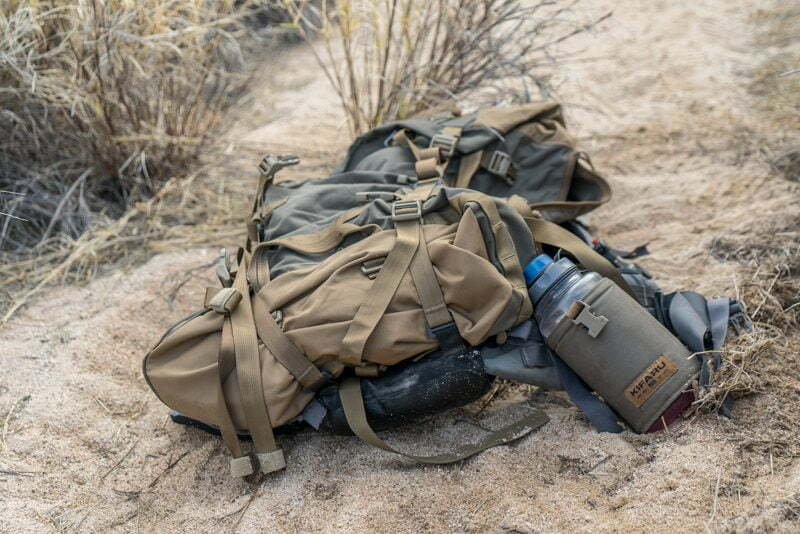 I had the opportunity to test the Crater this spring and was very happy with the layout and compressibility of the bag. While the Crater and Cavern have the same layout design, the Crater is the larger bag with an 8,000 cubic inch volume. 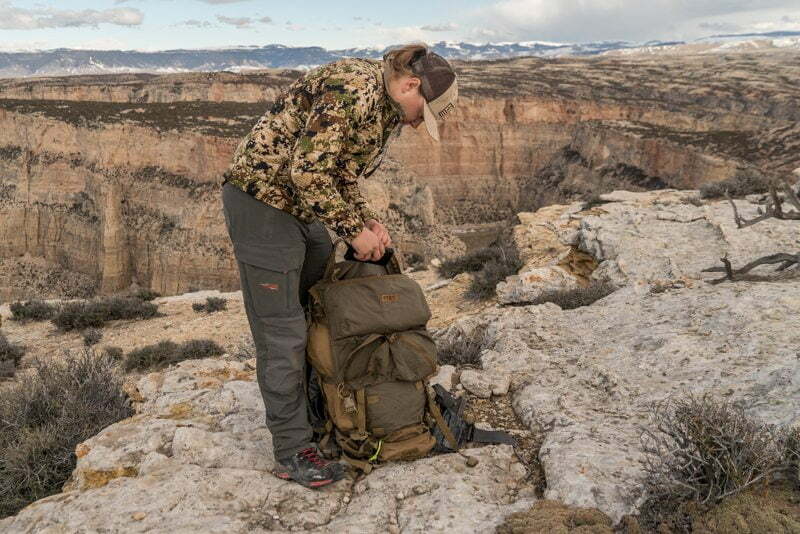 (Read Tony Trietch’s review on the Kifaru Cavern here) Other features include a fully enclosed, zippered spotting scope pocket, integrated fold-over lid on the snow collar, PALS webbing on the back and all around the bottom for attaching multiple pockets and a two-way side zipper for quick access. The snow collars integrated lid also has a set of PALS matrix webbing to attach belt pockets and has two tab loops for attaching a lid. Another popular feature they added is a sewn in meat shelf between the bag and the frame. They used the strap design from the popular Reckoning bag, with three straps along each side fastening the bag directly to the frame, and three more compression straps down the back that are independent of the side straps. 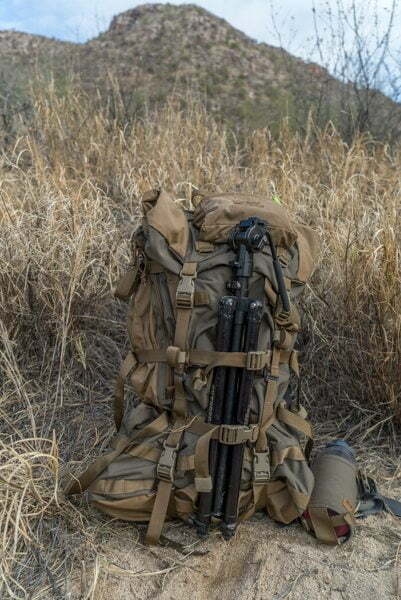 The independent straps let you attach your bow, tripod, trekking poles, arrows, rifle, etc. and allows you to quickly detach those items without losing compression in the main bag. The vertical straps connecting the lid can be moved to the desired height with the k-clip and daisy chain system. Two straps run underneath the bottom of the bag hooking it to the frame and letting you set the appropriate compression to the underside of the bag. The two handles on the top and bottom help with easy handling and the bottom handle holds a bow cam perfectly when strapping it on the back of the pack. Moving inside the bag there is a water bladder hanger with a hose port and a chamber pocket included. The first trip I took it on was to Mexico on a Desert Sheep hunt. 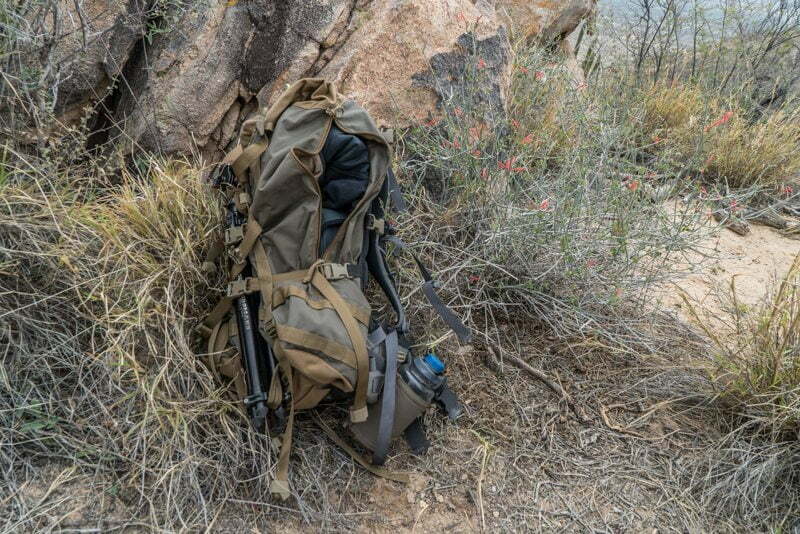 This wasn’t a multi-day backpacking trip, but it was a great test to the compressibility and day-mode function of the bag. I decided to run the bag without an additional lid, only using a medium belt pocket on the top. I completely compressed the bottom of the bag, folded over the integrated lid and used the side zip to load the pack. I stuffed extra clothing layers to the bottom then put my 15x binoculars, camera and day’s food on top of the clothing. I then opened the spotting scope pocket and put my glassing chair and a Nalgene bottle in it. Although I didn’t run a spotting scope on this trip, I’ve carried a 95mm Swarovski spotter in it with room to spare for my glassing chair or a puffy jacket. The medium belt pocket on the top held my Steripen, battery pack, inReach, and headlamp. I sucked the side compression straps down and strapped my tripod to the independent straps on the back. I was surprised how well it worked in day mode for being such a big bag. Usually, I would only unbuckle the top compression strap to access the side zipper which let the bag stay fairly compressed to the frame while I pulled items in and out. When I got home from Mexico I loaded the bag up for five days in the backcountry. At 8,000ci the Crater swallowed my gear with plenty of room to spare. With these bigger bags, I’ve found a fairly good method to keep the bottom of the bag from bulging when it’s not maxed out with gear. I put my sleeping bag in a Kifaru five-string compression sack and pack it first to the very bottom of the bag, forming a good base to build upon (I’ve found that not using a compression sack in this large of bag tends to bulge the bottom and not pack well.) Once the bottom is formed how I like it, I then tighten the compression straps that run underneath of the bag so they’re snug around the sleeping bag, then start packing the rest of my gear on top of that. In my experience, it’s helped keep a uniform pack shape instead of everything wanting to settle down and bulge the bottom of the bag. Another addition to the Kifaru line is the Organizer Guide Lid (OGL). They simply took their original guide lid and added some organizational features to it with two smaller zippered pockets, one larger zippered pocket, and a zippered back flat pocket. The larger compartment holds a DSLR camera and 70-200mm lens with ease and the smaller pockets are great for items like food, gloves, GPS, headlamps, etc. 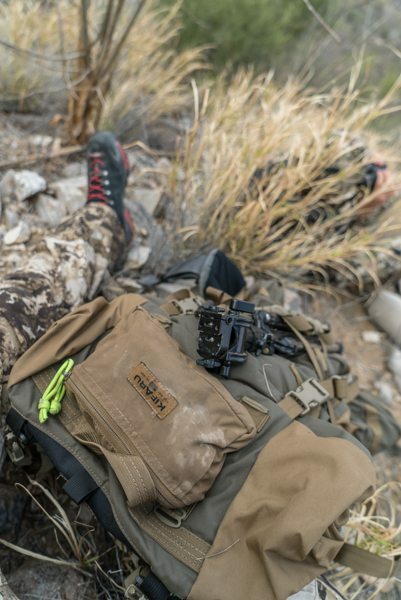 With the lid attachment tab loops on top of the Crater bag, you can hook up the OGL, Guide Lid, or Native or Quandary bags easily for extra space and organization. 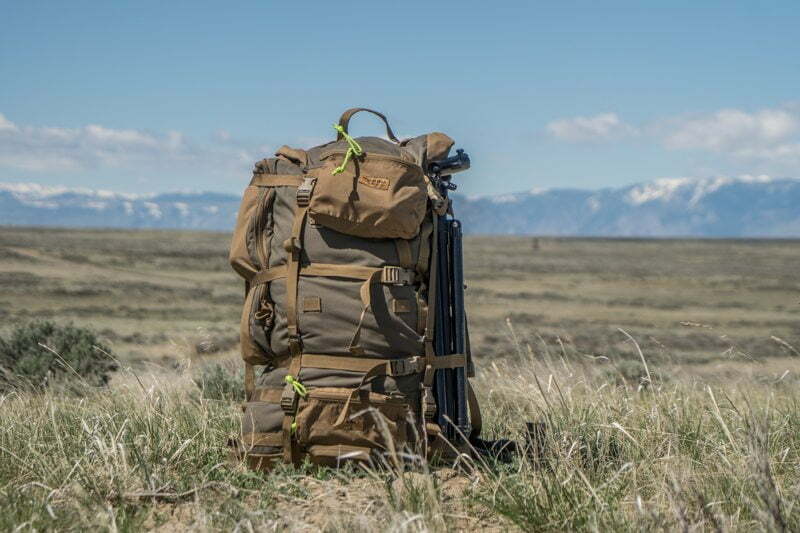 I think a lot of backcountry hunters are afraid of these large bags because they are possibly more than they’ll ever need. 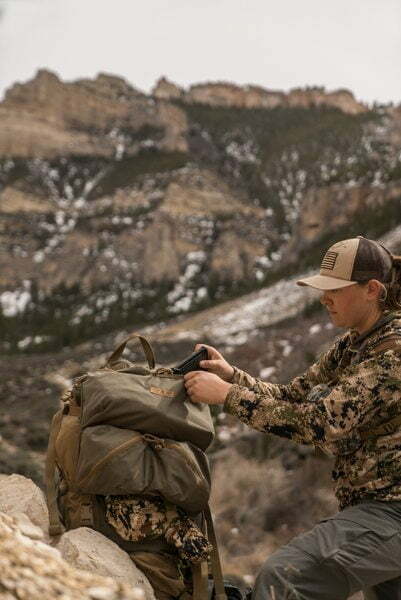 While I do understand that aspect, if you are going on a big backcountry hunt, you’ll want to get as much meat and gear out as possible on that first trip. If all of your gear alone maxes out your bag space, you aren’t going to have room for much meat. With the compression abilities of this bag, I would rather have the extra space than not. Like Aron Snyder says frequently, “I’ve never gone down the trail wishing I had a smaller bag”. All in all, the Kifaru Crater was a hit with me. Volume: 8,000ci including the spotting scope pocket.